Chronic back pain sufferers make take hope after a new study revealed that taking antibiotics could the relieve the crippling symptoms in about 40% of the cases. Researchers from the University of Southern Denmark and the University of Birmingham, England, believe they have found an important link between back pain and infection from bacteria. Back pain , like headaches are common complaintsby people and almost everyone has suffered from it at some in their lives, and recommended treatments to mitigate the symptoms includes painkillers, hot or cold compresses, lifestyle changes, physical therapy, and keeping active. 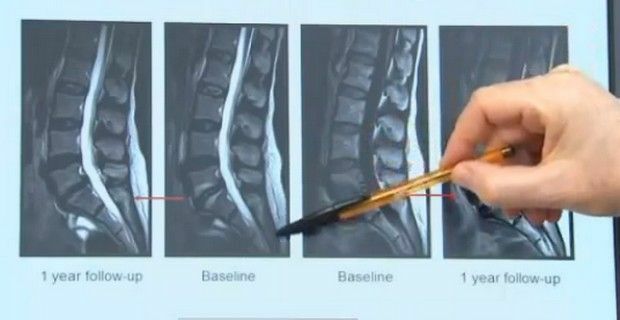 However, the study which was published in European Spine Journal was divided in two parts and was more concentrated on patients with herniated (slipped) discs. Previous research studies showed that between 7% and 53% of patients with herniated discs have a type of bacteria that entered the disc when it was first herniated. In the first study the Danish researchers found that in almost half the 61 patients that they studied had the same bacteria that causes acne, Propionibacterium acnes which also causes inflammation and micro fractures in the surrounding vertebrae. In the second study, a double-blind randomized clinical controlled trial, they treated 162 patients all chronic back pain sufferers, whose back pain had lasted for more than six months, with 100-day course of antibiotics (amoxicillin and clavulanate), while another group received a placebo and the findings were astounding, with 80 percent of the patients responding and benefiting from the antibiotic treatment. The ramifications of this type of treatment are massive, not only would it eliminate the need of the expensive and painful surgery for a large part of sufferers and it would also be simpler and inexpensive. Some experts however have warned that that the massive use of antibiotics could lead to more antibiotic-resistant bacteria and superbugs.